A recent trip to the local Farmer’s Market inspired this post about kitchen vignettes. I saw some gorgeous sunflowers and knew they had to come home with me. I have such a weakness for flowers. I just had to use these in a vignette. Today, I would love to share with you some great tips for creating a kitchen vignette of your own. It is something that is so simple to assemble. You can use items you already have on hand, and change it whenever you want to create a new look. First, grab a tray or a pretty platter to place your vignette upon. I’m sure you have something that will work. I used a silver tray that I had on hand. Some twenty-two years ago, I received a few as wedding gifts. They have tarnished over time, but I chose not to polish them. I like the antique look. Second, grab some flowers or a small plant. Most grocery markets carry fresh flowers and small plants at a very inexpensive cost. Often, I will just go outside to my garden and gather a bouquet. You can use a pretty vase, pitcher, teapot, jar, or other container you have on hand to place your flowers into. Get creative. Finally, assemble some items in different sizes and textures to place upon your tray or platter. You want to have varying heights and textures in your display. I chose some blue and white teacups so that they would be handy for my morning tea. On the other side of my tray, I placed a honey pot along with a creamer filled with spoons. I love honey in my morning tea. I also placed a coffee server upon the tray for my husband’s coffee. It is so much fun to create a kitchen vignette. Hopefully, I have inspired you to search those cabinets, and find things that you would love to display in your kitchen arrangement. We all have items that would make beautiful displays. You just have to think outside of the box, be creative, and shop your house. Thank you so much for stopping by. I hope that you have a wonderful and blessed day!!! Thanks. Beautiful inspiration! You have a blessed day also! Thank you so much Rae! I’m so happy that you stopped by and left such a sweet comment! The sunflowers make such a pretty contrast with your beautiful blue dishes. Thank you Eilis! I love blue and yellow together. I guess you could say I love blue with a lot of different colors. I hope that you are having a wonderful day!!! Blue and white dishes make me swoon…add sunflowers…I am over the moon! Thank you so much Crystal! I hope that you are having a wonderful day, and I hope that you have fantastic week!!! Shannon, that is a pretty vignette! Sunflowers are so happy…they always make me smile! 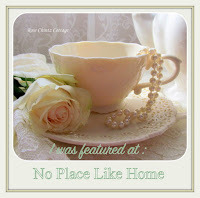 Your vignette reminds me of Nell Hill…I have her books and follow her blog! Happy Tuesday! Pam, what a sweet compliment! I love Nell Hill and follow her blog too! I hope that you have a wonderful day!!! Thank you so much Shelia for the very sweet comment. I have followed your beautiful blog for awhile. I have wanted to leave a comment for some time, but can’t figure out how to do so. Your home is beautiful, and I love your decorating style. I’m so happy that you stopped by, and I hope that you are having a wonderful week! Shannan you put a smile on my face. My Mom loved sunflowers and she loved blue and white dishes which she passed down to me. I can’t wait to pull out some sunflowers and my blue and white and try this for the Fall. Thanks for the idea and the memories I’m thinking about this evening. Debbie what a heartfelt and sweet comment! I’m so happy that this vignette made you think of your dear mother. How wonderful that you have her collection of blue and white dishes. My most treasured things are those that belonged to my loved ones. I use several of them in my decor, and it reminds me of them daily. Your comment really touched my heart. I’m so flattered that you shared your memory with me. I hope that you have a wonderful rest of your week! Just can’t beat sunflowers and blue and white china! Favorites! Thank you so much Snap! I hope that you have a wonderful Wednesday!!! I dont think there is anything as lovely and as collection of blue and white transferware… various patterns of beauty! And when you add the gold of sunflowers, “c’est magnifique”! Thank you so much Schotzy for your very kind compliment. I hope that you have a wonderful day!!! Shannon- I love blue and white and there is nothing better when you want to create a vignette. Hi Laura! Thank you for stopping by and leaving such a sweet comment! I agree there is nothing better than using blue and white dishes or pottery in a vignette. It is a classic! I hope that you have a wonderful weekend!!! Perfectly lovely combination of blue and my favorite Summer flower! Thank you Jemma! I hope that you are having a wonderful Sunday!!! Charming vignette, Shannon! Blue and yellow is so pretty together and very French. Thanks for sharing. Thank you so much Sandy for the sweet comment. I wanted you to know that I am so sorry for your loss and have been thinking of you. Thank you so much for allowing me to be a part of your party each week. There are so many wonderful features. I hope that you have a blessed week! Thank you so much Lori for your very sweet and kind comment! I’m so happy that you stopped by, and I hope that you have a wonderful day!!! Thank you so much Katherine! I hope that you are having a wonderful week!!! I found you on instagram! Love your style! The blue and white is striking. I am decorating the master bedroom at the lakehouse in blue and white! So far so good! By the way… I am Nance1052 on instagram. Good Morning Nancy! I’m so happy that you found me on Instagram! Thank you so much for your very sweet comments. I bet your lakehouse master bedroom is gorgeous decorated in blue and white! I found you on my Instagram and have started following you back. I’m new to blogging and social media. I’m learning a lot along the way. Again, thank you so much for stopping by my blog and leaving such a kind comment. I hope that you have a wonderful Saturday!! !